Berry Gordy ran his Motown hit factory as efficiently as an actual factory, rotating songwriters, producers, and artists through various configurations until they made magic, and then keeping a successful team together as long as they kept producing hit songs. Berry built a huge roster of successful artists, had legendary songwriting teams like Holland-Dozier-Holland and The Corporation, and produced many albums himself. But only one person fulfilled every role in the Motown machine — William “Smokey” Robinson, who wrote or co-wrote most of the Miracles’ hits, also wrote for the Temptations (“My Girl,” “Get Ready,” “The Way You Do The Things You Do”), Mary Wells (“My Guy,” “You Beat Me To the Punch”), and Marvin Gaye (“Ain’t That Peculiar”), all while touring and serving as Motown’s vice president. Besides creating some of the most indelible music of the 20th century with The Beatles, John Lennon and Paul McCartney were such prolific and talented songwriters it’s possible to put a pretty good greatest-hits album together just from their cast-off material (in fact, someone did). At the same time The Beatles were revolutionizing pop music, its chief songwriting duo was writing hits on the side for the likes of Peter & Gordon (“A World Without Love” went to No. 1 in the U.S. and U.K.), Billy J. Kramer (“Bad To Me,” No. 1 in the U.K.), Cilla Black, and even Portuguese singer Carlos Mendes. McCartney also wrote Badfinger’s biggest hit, “Come And Get It,” and rumors persisted that he had in fact written all of the band’s songs. Prince has had a large stable of protégés, including Morris Day And The Time, Sheila E., and Apollonia, for whom he served as a primary songwriter. And one of His Royal Badness’ biggest hits was one he never recorded a studio version of—“Nothing Compares 2 U,” which Sinéad O’Connor took to No. 1. The Purple One also wrote “Manic Monday” for The Bangles, “Sugar Walls” for Sheena Easton, and “I Feel For You” by Chaka Khan. Just as he was entering the slightly more mainstream era of his career, the Misfits’ hulking frontman Glenn Danzig got a chance to write a song for an unlikely, less-overtly aggressive collaborator—“The Big O,” Roy Orbison. While not an obvious musical match, in 1987 Danzig penned “Life Fades Away” for Orbison, and the song was included on the soundtrack for the film adaptation of Bret Easton Ellis’s first novel, Less Than Zero. A few years later, in 1994, Johnny Cash released American Recordings, which included both original tracks and songs written by the likes of Tom Waits and Danzig, who allegedly whipped up the lyrics for “Thirteen” in about 20 minutes. Long before fun. 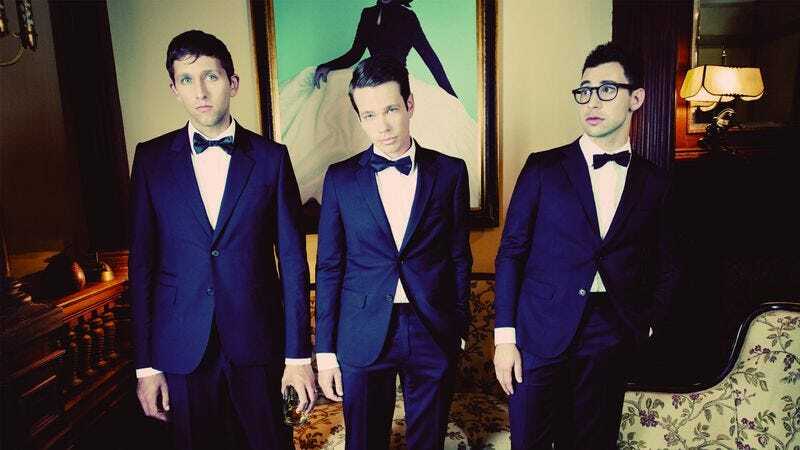 became Queen-inspired Top 40 darlings, Jack Antonoff and Nate Ruess were carving out separate songwriting careers as members of askew sparkle-folk act Steel Train and underground pop darlings The Format, respectively. Oddly enough, this experience in the indie trenches informs each man’s songwriting sidecars the most. Ruess’ harmonic imprint and lyrical vulnerability is a hallmark of Pink’s recent No. 1 single “Just Give Me A Reason,” while his roller coaster vocal delivery and phrasing informs the hook on Ke$ha’s “Die Young.” Antonoff, meanwhile, has kept things sweeter and lighter on his forays into co-songwriting. Tegan And Sara’s “How Come You Don’t Want Me” and the new Taylor Swift single “Sweeter Than Fiction” are frosty, melancholy ’80s synthpop, while Sara Bareilles’ “Brave” has the quirky charm of Steel Train’s best work. Shaking off the expectations that come from having Loudon Wainwright III and Kate McGarrigle as parents, Rufus Wainwright has forged an eclectic path, from recording a Judy Garland cover album to writing the opera Prima Donna. It’s unsurprising, then, that Wainwright has also worked as a songwriter for other singers such as Josh Groban (“Au Jardin Des Sans-Pourquoi”), Jaime Cullum (“Where Is Your Heart At?”), and his family friend Linda Thompson (“Beauty” performed with the help of Antony Hegarty). Notably, Wainwright’s “Apartment,” written for Shirley Bassey, was the first track recorded for Bassey’s comeback album, The Performance. But Wainwright is more discerning than a typical songwriter-for-hire, mostly keeping his compositions for friends or artists who intrigue him. In the first decades of his career, Stevie Wonder was an absolute machine, writing and recording classics at a pace even the other prodigies on the Motown label couldn’t keep up with. Despite that track record—or maybe because of it—Motown president Berry Gordy was reluctant to risk messing with a sure thing by granting Wonder full creative control over his albums. It was in part to convince Gordy to loosen the reins that Wonder, who had already written or co-written songs for other Motown acts, including Smokey Robinson And The Miracles’ hit “Tears Of A Clown,” took on the struggling Motown group The Spinners as a pet project in 1970. Written, produced, and even largely performed by Wonder, “It’s A Shame” became The Spinners’ first hit in ages, and their biggest smash for Motown, proving what Wonder was capable of when working without restrictions. That song (and some savvy contract negotiating tactics) granted Wonder the creative autonomy he needed to go on to record his visionary ’70s records, but he never stopped penning songs for others. In the decades that followed, he wrote for Michael Jackson, Jeff Beck, Rufus & Chaka Khan, Roberta Flack, The Beach Boys, Eddie Murphy, and Whitney Houston. Though Willie Nelson’s career didn’t really take off commercially until the outlaw country boom of the ’70s, the braided singer signed his first record contract in 1958. Under that contract, he wrote songs like “Family Bible” for Claude Gray and “The Storm Has Just Begun” for Pappy Daily. In 1960, Nelson moved to Nashville, where he couldn’t find a record deal but did find a gig playing bass in Ray Price’s band, the Cherokee Cowboys. During his time with Price’s band, Nelson sold a number of his original compositions to guys from the Nashville scene, including Price himself, Faron Young, Roy Orbison, and Billy Walker. Most famously, though, was Nelson’s sale of his track “Crazy” to Patsy Cline. Though previously recorded by Nelson, Cline’s version would go on to become the definitive recording of the track and one of the biggest jukebox hits of all time. The first No. 1 record credited to a Beach Boy wasn’t recorded by the Beach Boys: In the summer of 1963, Jan Berry and Dean Torrence reached the top of the charts with “Surf City,” written by Berry with an assist from Brian Wilson. That Jan And Dean hit marked the beginning of Wilson’s brief run as impresario of the surf-rock set, a period during which the head Beach Boy indulged his Phil Spector aspirations by penning Jan And Dean tracks and overseeing his own girl group, The Honeys. With his flagship group working toward its creative and commercial peak, Wilson split his time between Beach Boys’ sessions and writing and producing for the likes of Sharon Marie, Gary Usher, and fill-in Beach Boy Glen Campbell. Campbell’s “Guess I’m Dumb” didn’t find many fans in 1965, but its lush arrangement and romantic angst now play like a lost cut from Pet Sounds. Armed with critical acclaim from the release of his debut album, 1977’s My Aim Is True, Elvis Costello quickly translated his plaudits into sales, earning his first—but far from last—position in the U.K. Album Charts Top 10 with his sophomore effort, 1978’s This Year’s Model. The following year, Costello provided Georgie Fame with the title track to his 1979 album, That’s What Friends Are For, in an early example of Costello’s desire to give back to the artists who’d helped him forge his own music. In addition to giving Robert Wyatt the opportunity to release “Shipbuilding” as a single a full year before Punch The Clock hit shelves, Costello provided songs to Johnny Cash (“Hidden Shame”), Roger McGuinn (“You Bowed Down”), and The Chieftains (“St. Stephen’s Day Murders”). Costello also gave “(I Love You) When You Sleep” to Paul Weller’s protégée, Tracie; contributed “Passionate Fight” to Ute Lemper’s 2000 release, Punishing Kiss; and wrote the better part of an album’s worth of material—ultimately entitled Now Ain’t The Time For Your Tears—for former Transvision Vamp frontwoman Wendy James. In a nice nod to the Brill Building era of songwriting, Costello also wrote the song “Unwanted Number” for the 1996 film Grace Of My Heart, where it was recorded by R&B quartet For Real.